Janamejaya (Sanskrit: जनमेजय) was a Kuru king who reigned during the Middle Vedic period (12th-9th centuries BCE). Along with his father and predecessor Parikshit, he played a decisive role in the consolidation of the Kuru state, the arrangement of Vedic hymns into collections, and the development of the orthodox srauta ritual, transforming the Kuru realm into the dominant political and cultural center of northern India. He also appears as a figure in later legends and traditions, the Mahabharata and the Puranas. Janamejaya is mentioned as a great king and conqueror in a number of late Vedic texts. The Aitareya Brahmana (VIII.21) states that his priest Tura Kāvasheya anointed him with the Aindra Mahabhisheka (great anointing of Indra). The Shatapatha Brahmana mentions that he performed an ashvamedha (horse sacrifice), for getting himself rid of the Brahmahatya (sin associated with killing of a Brahmin), and the priest who performed it for him was Indrota Daivapa Shaunaka at a place named Āsandīvat. H.C. Raychaudhuri dates Parikshit, his father, in ninth century BC. Michael Witzel dates the Pārikṣita Dynasty of the Kuru Kingdom to the 12th-11th centuries BC. Four copper-plate grant inscriptions purportedly issued during Janamejaya's reign were discovered in the 20th century, but were proved to be fake by historians. In Mahabharata, Janmejaya was mentioned as having six able brothers viz, Kakshasena, Ugrasena, Chitrasena, Indrasena, Sushena and Nakhaysena. The initial chapters of the epic narrates various aspects of his life including his conquest of Takshasila and about his encounter with Nāga Takshaka. He wanted to exterminate the race of Nagas, since Takshaka was responsible for the death of his father Parikshit. Parikshit bitten by Takshak from Birla razmnama. Emperor Janmejay was responsible for the retelling of the famous epic Mahābhārata, a story of Janmejay's ancestors from the time of Bharata up to the great Kurukshetra war between his great-grandfathers the Pandavas and their paternal cousins the Kauravas. 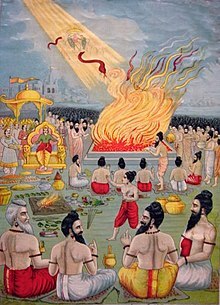 The Mahabharata states that it was recited to Janmejay at the sarpa satra (snake sacrifice) by the sage Vaishampayana to whom it had been imparted by his perceptor Vedavyasa, after he asked Vaishampayana about his ancestors. 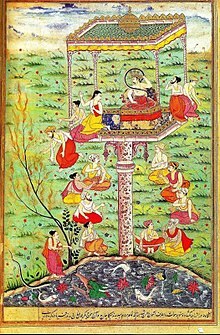 The snake sacrifice of Janmejay, as Astika tries to stop it. Emperor Janmejay ascended to the throne of Hastinapura upon the death of his father Parikshit. According to legend, Parikshit, the lone descendant of the House of Pandu, had died of snakebite. He had been cursed by a sage to die so, the curse having been consummated by the serpent-chieftain Takshak. Janmejay bore a deep grudge against the serpents for this act, and thus decided to wipe them out altogether. He attempted this by performing a great Sarpa satra – a sacrifice that would destroy all living serpents. At that time, a learned sage named Astika, a boy in age, came and interfered. His mother Manasa was a Naga and his father a Brahmin. Janmejay had to listen to the words of the learned Astika and set the then-imprisoned Takshaka free. He also stopped the massacre of the Nagas and ended all enmity with them (1,56). From that time onward, the Nagas and Kurus lived in peace. The mass sacrifice was started on the banks of the river Arind at Bardan, now Known as Parham, a corrupt form of Parikshitgarh. A masonry tank (reservoir) said to have been built by Emperor Janmejay to mark the site of the sacrificial pit, known as Parikshit kund, still exists in Mainpuri district. This is known as Gowdvana. Close to this village a very large and high khera[further explanation needed] containing the ruins of a fort and some stone sculptures has been found. It is said to date back to the time of Emperor Parikshit. A popular local legend is that as a consequence of the virtues of that sacrifice snakes are still harmless in this place and its neighborhood. According to Puranas, Janamejaya was succeeded by his grandson Ashwamedatta. Further in the lineage, are mentioned, Adhisima-krishna and Nichakshu. After the time of his successors, the dynasty came to an end. ^ a b Pruthi, Raj (2004). 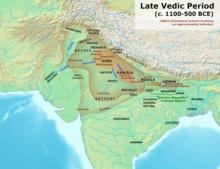 Vedic Civilization. Discovery Publishing House. ISBN 9788171418756. ^ Raychaudhuri 2006, pp. 29-30. ^ Richard Salomon (1998). Indian Epigraphy: A Guide to the Study of Inscriptions in Sanskrit, Prakrit, and the Other Indo-Aryan Languages. Oxford University Press, USA. p. 167. ISBN 978-0-19-509984-3. ^ Shankar Goyal (1996). History writing of early India: new discoveries and approaches. Kusumanjali. p. 1. OCLC 34752382. ^ Raychaudhuri 2006, p. 15, 35n.